Trade Reading Order » Uncle Gorby’s Corner Of Free Stuff: DC Kids! Read through 52 and the Heroes & Villains page? Watched all of the Wonder Woman, Batman, and Swamp Thing you can handle? Fret not freebie fans, as Uncle Gorby’s Corner of Free Stuff has returned! 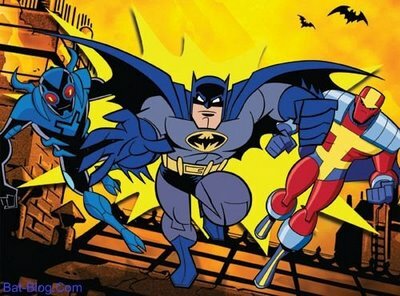 After our visit to DC Beyond, I promised you a return to Kids WB… well, don’t say your favorite uncle doesn’t deliver. Presenting the freebies of DC Kids! DC Kids is basically the reason the aforementioned DC Beyond exists: to get your attention to the on-site store. The mission statement of DC Kids, to be sure, is to sell you games, toys, DVDs, and comics, but it’s that last one we’re most interested in today: DC Kids makes select issues of their most prominent lines available for free. Batman: The Brave and the Bold #1 is the first issue of a series based on the sorely under-appreciated television show, which was recently revealed at Comic-Con to be Grant Morrison’s favorite currently running series. 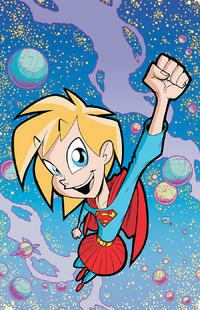 Supergirl: Cosmic Adventures in the Eighth Grade #1 introduces a miniseries that’s partly Archie Comics, partly Sailor Moon, and all Supergirl- read it to get a unique, middle school spin on the Superman mythos. Billy Batson and the Magic of Shazam! #1 is a follow-up to 2007’s highly acclaimed miniseries Shazam! : The Monster Society of Evil, creating a pleasing blend of the incorruptible forces of Johnny DC and Golden Age comics. Super Friends #1 is the start of a long, long overdue series based on the DC cartoons of the 70s and 80s- if you’re one of those guys who get nostalgic every time you hear the “pong!” of Aquaman summoning his aquatic charges, this is for you. Take a serious look at yourself. Do you have enough unrepentant adorableness in your life? If you have to ask, the answer is no. Read Tiny Titans #1. Justice League Unlimited #1 is self explanatory. If you love the DCAU as much as I do, then this one’s at the top of your list. Also, Looney Tunes #100, Scooby-Doo #1, and Cartoon Network Action Pack #27. But who cares? JUSTICE LEAGUE UNLIMITED.